Strong economy drives earnings growth, risk appetite, valuations. According to FactSet, second quarter results for the S&P 500 companies were strong, and technology companies led the parade. At the end of July about half of the S&P 500 companies had finished reporting financial results for the second quarter. On average, earnings per share were up 21%, thanks to tax reform and a good economy. So good, in fact, was the economy that sales rose 9.3% for the average S&P 500 company from a year before. These results are made all the more extraordinary given that we are not in the early stages of an economic recovery, but many years into one, a time when we might expect things to be settling down. As for leadership, the technology sector posted the most superior results. Ninety percent of companies in the tech sector beat expectations and revenue growth grew an outstanding 14.4%, year-over-year. 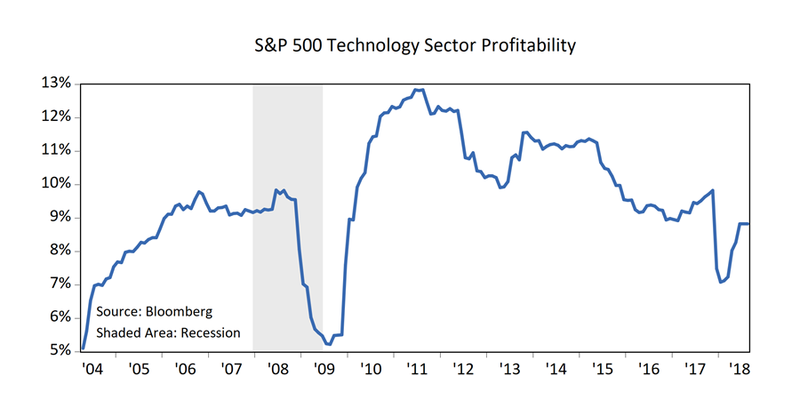 Based on Bloomberg data, the expected profitability for the technology sector (measured as return on assets) is seen at 14.6% in the year-ahead. If achieved, this would be the highest level of profitability by the sector, relative to assets, ever achieved (chart, below). This is a very good report card for corporate earnings and the leading growth sector, information technology. We now live in an era of trillion-dollar technology companies, supported by strong current earnings and revenue. But we are reminded of past eras like the 1960s, when growth juggernauts like Polaroid (now defunct) were seen as unstoppable. While ultra-high valuations make for good headlines, they don’t always translate into generous future returns, and excessively high valuations can conceal hidden risk. It makes sense to both acknowledge the tremendous success of today’s biggest growth companies, and then continue to assess their potential going forward. There are a few ways to look at valuation, and none is perfect. A price-to-earnings multiple is a crude way to relate a stock price to earnings potential. Here we see that the technology sector (the main driver of the “growth style” category) now trades at 19x forecast earnings, using FactSet estimates. This is 31% higher than the sector’s average 10-year multiple of 14.5 times. By contrast, the S&P 500 trades at a forward looking multiple of 16.7x, about 16% above its 10-year average of 14.4x. 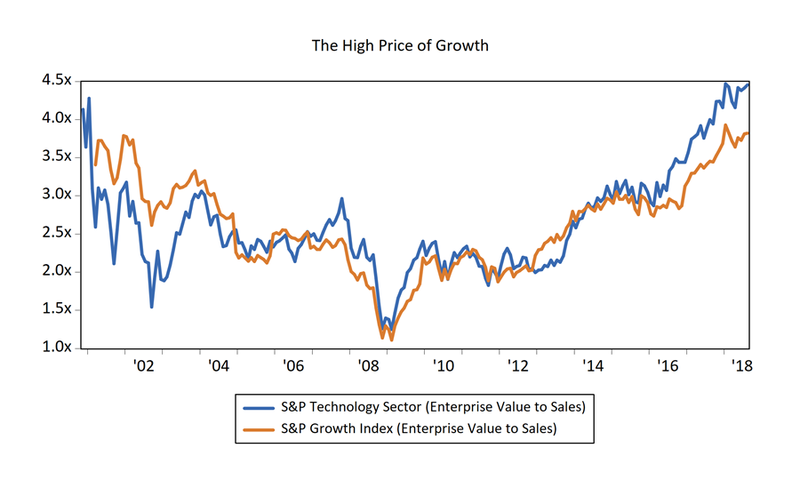 Another way to come at the valuation question for technology and the growth category is to look at “enterprise value” and relate that to sales. 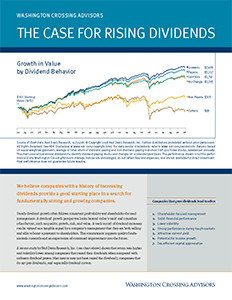 Enterprise value adds together the value of the stock with any outstanding debt, net of cash. We like this measure because it incorporates debts directly into the question of value. If we divide this number by a company’s sales, we answer the question “How much does it now cost to buy a dollar of sales when we buy a stock, including any outstanding debt and cash held by the company.” The graph below shows how much investors are paying for a dollar of revenue for both the S&P Technology sector and the S&P 500 Growth index based on enterprise value. As you can see, valuations are high, likely reflecting some combination of lower expected risk, and higher expected growth. Ultimately, these sorts of valuations (whether measured as price-to-earnings, enterprise-value to revenue, or some other measure) tend to fluctuate up-and-down, but not grow continually. They tend to “revert to the mean” over time. 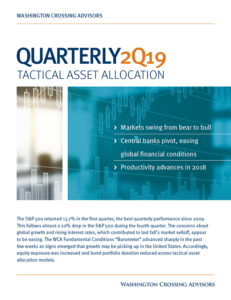 This process leads to periods of outperformance and underperformance by growth sectors and growth style of investments versus other sectors and the value style. Tactically, we are tilted toward value over growth. This is not because we believe technology companies or other growth sectors do not have a bright future, but because the market already seems to be attaching a very high set of expectations and very low probability of risk to these investments. Indeed, over the decades growth stocks have proven to deliver strong, risk-adjusted returns as whole new industries have been created, opening up potential for massive wealth creation. However, like any other asset, there is a price to be paid and valuations do matter to performance. At this point, we are finding better value and expected risk-adjusted returns on the value side of the growth-value spectrum.